Learn more about the Lorex Home Security System with 6 Cameras and Varifocal Lenses. Get pricing, features, and answers to common questions. 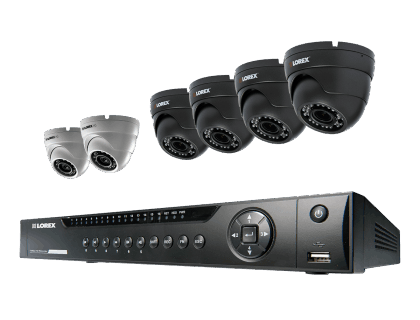 The Lorex Home Security System with 6 Cameras and Varifocal Lenses comes with an LHV2000 HD digital video recorder (DVR), four LEV2712B HD and two LEV2724B HD dome security cameras. This Lorex security system can accommodate up to ten more cameras. 8 HD 1080p cameras (including 4 varifocal). 1080P DVR can support up to 16 cameras. 150 ft. maximum night vision range. Pros: Cameras have corrosion-resistant aluminum bodies. No monthly fees. Cons: Recording feature complicated according to some customer reviews. Bottomline: Complete security system that can be expanded with more cameras as your business grows. What are some alternatives to the Lorex Home Security System with 6 Cameras and Varifocal Lenses? Where can I buy the Lorex Home Security System with 6 Cameras and Varifocal Lenses? The Lorex Home Security System with 6 Cameras and Varifocal Lenses is available via Amazon and the Lorex website. Does the Lorex Home Security System with 6 Cameras and Varifocal Lenses work at night? Yes, it comes with four LEV2712B security cameras that have a night vision range of up to 130 ft. Its two LEV2724B security cameras have a night vision range of up to 150 ft.
Can the Lorex Home Security System with 6 Cameras and Varifocal Lenses be used in any weather? Yes. The IP66-rated cameras that come with the Lorex Home Security System with 6 Cameras and Varifocal Lenses are suitable for indoor and outdoor use. These cameras are resilient to inclement weather, and function in temperatures from -22 °F to 140 °F.